Sydney, we most definitely love our pancakes. Even so judging by the crowds that turn up to the ever popular Pancakes On The Rocks outlets in Sydney. Well, judging by the awesome turn out at both their locations at The Rocks and Beverly Hills respectively. 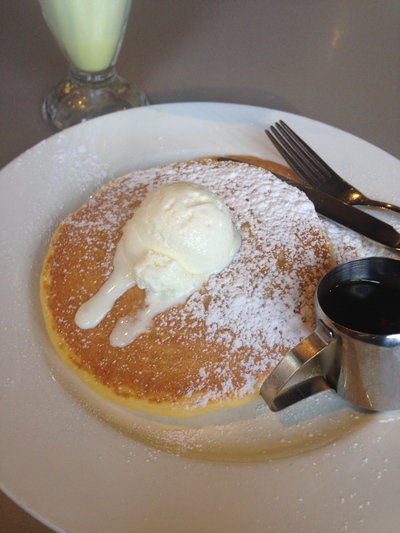 Some top places to enjoy some quality pancakes in Sydney. Get that maple syrup and ice cream stocked up. Oh yes, and your runners too. Both of their locations at The Rocks, and on King Georges Road in Beverly Hills are winners. If you're in the mood for pancakes here, simple is often the best. Go for an original stack - long or short. I ask for ice cream and maple syrup. This treat never disappoints. Save your hunger and go for a stack of four, and you'll be surprised that you've spent less than $10 on this treat alone. You will be full and satisfied at the end. They give you two jugs of maple syrup, but you only need one. If you want to keep the momentum going at home, the Beverly Hills store allows you to buy the original mix to take home with you. Thick and fluffy - love it that way. Pancakes with fruit is utterly divine here. Berries supreme. I came out full on this end of Military Road. Enough said. Fruit heaven. Check out the pictures by clicking here. Although not on the overly affordable side, Bourke Street at Surry Hills has done it again in the sweet stakes. These thin and thick plain fluffy pancakes leave you in a state of trance...to the point you forget to review the establishment. Until now. Expect the freshest berries on top. Other choices include Rosebud Cafe at Rozelle. Their menu has changed. I need to find the resolve to head back inside and give them another crack so to speak. Furthermore, there is an American style cafe on Barrenjoey Road on Newport Beach. Wow, they make the thickest and fluffiest pancakes with fresh berries immersed inside. For the life of me (pity that) I cannot remember the name of this place. It will come. Cost: Affordable to flash, depending on you. When: When you're in the mood for pancakes - brunch or lunch. Good for kids: Yes. Those little vegemites will be full to the rim. Take away: No. Part of the fun is eating in.